Whenever and wherever I mention that I live in Hyderabad, I am subjected to a pyroclastic flow of Hyderabad’s glorious past gushing out with a sense of pride — my tone shrieks with exclamation marks when I have to say Hyderabad!! Hyderabad founded by Quli Qutb Shah with a city plan ready in 1591, incorporating many of the features of the mythical Islamic heaven, now abounds in recurrent images, phrases — and stories that are less myth more truth, than most. There is something drone-like about the cliches; the state long presided over by the world’s richest man, home to the Salar Jung Museum, the Charminar, the Golconda diamonds, and the most likely to the Kohinoor, the Orloff, the Jacob, the Hope, the Great Mughal, the Darya-i-Noor. Hyderabad is a distinct Deccani culture, the product of a very particular mixture of peoples and influences. It was based on religious tolerance, courtesy, hospitality, love of arts and a first-rate civil service which made no distinction between creeds or caste or class. Religious tolerance —that rare value of accepting different cultures readily — has been an integral part of the culture of the Deccan for good reason. 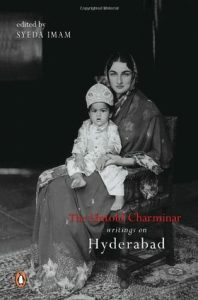 This hair-raising book, the untold Charminar’, Syeda Iman is a gleaning of many who touched the city and were moved; who know and will tell; who relish and wish to share that relish. Finally, although the Hyderabad that I reckon — the city of pearls, the city of lakes, the city of gardens has died, Hyderabad lives on! !